He slowly went to the last bed in that room, just to see his loving mom lying unconcious in a bed, though he is not an expert in analyzing the ECG monitor, but he dared to have a look at it, it was fluctuating in all possible manners which really made him worried, thanks to some good old movies where they have shown that if the ECG monitor draws a straight line, then that's the end, so to that extent, he is aware that his mom is alive. He slowly inched towards her bed and carefully dragged a chair close to her bed, suddenly his mom's face started to fade from his sight as his eyes pulled the water screen in front of his retina. He knows that he should not cry, but somethings are beyond human control. He felt the pain of those injections and needles that were pierced on all possible nerves on his mom's body, he told to himself that, he should have taken care of her very well, he should'nt have allowed for such a situation to have arised in the first place, with these thinking going in his mind, a tear drop fell on his mom's hand, may be that tear drop was too hot for his mom to handle, immedieatly she was brought back to her senses, she slowly opened her eyes to her son staying next to her with his fingers crossed over his forehead, she gathered some strength and weaved her fingers over Vineeth's head. Vineeth could not believe that his mom is still concious and she is recognizing him. It was one of the greatest moment of silence in both their lives, all that was exchanged between them was their eye to eye contact, he knows very well that Anjali did not take care of his mom very well and she treated his mom more badly than a maid, but his mom never complained about Anjali and was doing all the assigned tasks, just because she wanted Vineeth's life to be happy and she should not be the cause for any worries. Vineeth looked at his mom as if he has to say 1000 sorries to her and his mom looked at him as if she has pardoned both of them 1000 times. He just could not control his emotions anymore, so he burst out with a very big screem. Immedieately the lights were on and he heard a loud voice screaming "CUT ... CUT ... CUT", the scene was shot perfectely in the way director wanted it to be and there was a big round of applause in Ramoji Rao studio, where this scene was shot for one of the upcoming tamil movie. I asked myself why I am like this ? Why cant I accept these little changes of life ? But I could not get an answer. That guy was at his best attire that day just to impress his sweetheart, and he was making the environment lively, people around him started to enjoy his chat and were laughing non-stop, It was me who was doing that all the time now, but today this guy has taken up my position. This is what is all about human heart and mind, its pretty difficult to accept changes in life and especially if that change is not favouring our desire. I just could not resist moving away from that place, but I thought I should not do that, because that guy has all my striking resmblence of mine and I was watching him constantly. I immedieately called my friend and asked him, Hey did you see that guy, who is wearing a similar black coat as mine, does'nt he look like me ? His mannerisms, his actions all are like me ?, My friend gave me a nasty stare and told me that, Oh yaa, he is exactly like you and that is what I say is the power of SAINT GOBIN clear reflective mirrors, you drunken nut. Varun came rushing towards her with his mouth full of apologies, as she just could not get upset on Varun she posed a fake anger and pretended as if she is upset on him, Varun very well knew that its just a prank and hence he did not take it seriously. Varun just switched to the serious tone and asked Kavya whether she is all set for the marriage ? Kavya told him that she is very nervous over the whole issue and she just could not imagine the fact that the marriage is going to take place in a "Registar Office". Varun comforted her saying that, this is something which they both have mutually agreed and there should not be any setback in this. Kavya still appeared to be nervous and asked "What if the dad and mom come to know about this ? ", Varun said, at some point in time this has to come out, so its good that the issue is gonna come under the light very soon. Varun asked her to be cool and less nervous, and also gave her a list of things that she needs to get from her home. Kavya then raised the big question, btw - How much money I need to carry ?, Varun realized that he has forgotton that main point, He then with a little bit of hestitation told her to bring the maximum possible from her side. They then discussed about the route plans through which they are going to come to the Registar office, and they too know the fact that they should not give any feelers to their parents about this. Kavya and Varun spent the rest of the time on the beach and were just silent. The D-Day came and both were all set to start to the "Registar Office", Kavya was extremely nervous and she has not done anything like this in her past and she felt bad that she is doing this against the wish of her dad and mom. Kavya knows that its not time to get emotional or centimental and hence she decided to leave home. Kavya and Varun followed their plan and reached "Registar Office" on time, Varun was waiting for her and there was a sense of urgency and anxity in his speach, He asked her "Have you brought the Mangal Sutra", Kavya rightly took that gold "Mangal Sutra" from her bag and gave it to Varun, Kavya was not sure why Varun is so tensed. Varun told her in a husky voice that some how the matter got leaked and there is a mob which is planning to storm the "Registar Office" any moment, Kavya was shocked to hear that and both of them rushed to the registrar and they were joined by all their college mates who have gathered to witness the marriage of "Vineeth and Sandhya", Kavya and Varun were the two key witnesses to this marraige, inspite of knowing the rough political background of Sandhya's dad they both agreed to sign the witness singnature for them, though they were asked NOT to do so by their parents as it might lead to some threat to their lives. Both Kavya and Varun sighed a sign of relief after Vineeth tied the knot on Sandhya. Ah, we were all brought up by hearing stories about mystical characters who live up above us. Its starts from Yama dharma to Chitragupta to Rakhshasa's to Mogini's. I am sure none of us (even who told such stories) would have seen them (they do not want to also), but the way they narate those stories, a screen un-winds in our mind and we start to paint faces for those unseen GOD's, you wont believe, for a long long time I used to co-relate our good old actor Mr. S.V. Ranga Rao as Yama always, dunno why, but when I hear stories about Yama, this guys face is vizualized in my mind. : Hi, Chitragupta, How are you doing today ? : So can you brief me with the status of the projects ? :: Oh ya, the current one which is currently being worked upon is the "Bird-Flu" project, where we are expected to have a headcount of 500+ in INDIA and the rest at Onsite, but it looks like there a couple of unresolved issues in executing the "Bird-Flu" project as we are yet to decide on which bird we have to start with. : Oh ok, why can't we start with Chicken ? I heard lotsa ppl are eating that, and its a pretty easy way to increase the head count, also its easy to hire lots of chicken for this. :: Ah. not a bad idea, I would then as the HR team to talk to the rectuiters and employ more chicken, so by end of this week we can roll-out the Bird-Flu stuff worldwide. :: We currently have an escalation on hand ? : Oh, thats bad ? Whats his experience ? :: Thats ok, but our clients (Bus, Lorry, Train, they are all the clients) feel that he does not deserve such a natural recruitment, they want him to be sqeezed and then brought here. : Oh, but I know there is no way he can get back to earth, so do one thing, put him under the recruitment team for HEAVEN, I know thats one area where we cannot find resources, and let him try his best to get some good quality people there. : Ok, makes sense. So any information on the deliveries ? :: Yes, we have made a total of 11,34,567,768,234 new developments worldwide during last week, out of which, 23,443,534 pieces were defective and 54,353,532 pieces were taken back, as the owners of those products were not good. : Hmm, If I need to draw a productivity metrics out of this, which team is more productive ? Is that the New Development team of the Firing team ? :: Ah, its pretty difficult to say that, because the New Development is happening at a faster rate than the Firing team, especially our India Development Center is leading the deliveries table and they play a huge role in that ? : Ah, I know, IDC is always fond of new development. :: Also we have our messengers in earth (Bomb attacks, Epidemic, Floods, Fire accidents, Terror Attacks etc etc) who are trying their level best to improve the efficiency of firing department but, New Development team is much quicker than them. : I am a little concerned about the numbers you have shown on the "Defective Pieces" that were delivered to our customers, are the QA guys doing their job ? :: Ya, even I am a lil worried about that, I spoke to the QA (Vishnu) manager, he claims that the reason for defective pieces could be due to the health condition of the owners themselves. They are all addicted to Smoking, Drinking and other bad habits which eventually affects the new releases. : Well, lets have an check on that and ask our Firing department to concentrate more on the resources who are drinking and smoking, I think its easy to hire those resources. : Oh, interesting, whats that ? :: Its a very intersting project, where we can hire heaps and heaps of people in just a flash ? : Sounds good ... Can you tell me more about that ? :: Oh yaa, actually our development team has named it as "Global Warming" where it increases the temperature of the globe and it will cause serious damage at the later stage to all the people, and the beauty of this project is, the people will not have any sign's untill they actually face it. : Good, so can you explain me the technical architecture of it ? :: Its very simple, we are using a medium called "Plastic" to start with, which when thrown on ground and left as it is for a longer period of time, it creates a gas called "Chloro Fluro Carbon" which is very dangerous to all the resources, but unfortunately, our resources are so used to that material, so that they cant live without it, in short, its an enemy which sits amongst them and finally kill them. If this project becomes a great success, I am sure we need to expand our rectuitment team / HR, as we will have loads and loads of resources joining us every day. : Hey cool Chitragupt, it was an wonderful status reporting and I wish you all the great success for your new project. We will continue chatting on this topic and let me know the updates. : Oh, ya, its my pleasure Yama. Take care and talk to you later. I just should say that I was attracted by the way that genius spoke to me, he asked me about my studies, he asked me about my new job (I was new to Covansys that time), he actually spoke to me like a brother, also he adviced me to be committed in whatever I do. I felt as if I have attained the purpose of my birth in this world that day. I always celebrate this day as my own brother's birthday, and I make sure that I visit a nearby temple and pray for his well being. Some people do not know what kind of an impact they have made in other's life and Sachin Tendulkar is one person who has changed my life forever. I wish and pray to GOD that this demi-god should live longer with good health and atleast till the next cricket World Cup, I want to see my little master to play for my country. Wishing you a very Happy Birthday from the bottom of my heart my dear Sachin. You are simply an idol for me and I think I cannot have anyone else other than you in my life to be my "Role Model". HAPPY BIRTHDAY TO YOU MY DEAR BUDDY!!! It not only gives us entertainment and laughter, but also it teaches us a BIG lesson of how to be kind to other, no matter what they do for us. It also stress upon the very important factor of life, "Just keep up your words" (I do follow that for sure). 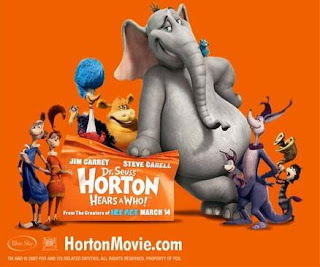 The story is all about an elephant (Harton) tries to save a whole world of people who are living inside a spec, and how he overcomes the ordeal that he faces while safeguarding them is the story line. Rest ... better you ppl watch it. There were so many hilarious scenes and animations in the movie and also a bunch of humorous dialogue's. I liked this harton more than the serious "Maddy" of ICE AGE1. This is one movie which deserves a 5 star rating. I bet you guys, who will seriously appreciate why they have to name the movie like that, after watching it, Its awesome. A SPECIAL THANKS TO MY DEAR FRIEND ASHOK, WHO GAVE ME THIS MOVIE TO WATCH, A BIG KUDOS TO THAT SWEET GUY. THANKS A TON BUDDY, GOD BLESS YOU. I was constantly getting wireless messages from my Lt. General and confirming my joining date. I too know the seriousness of the situation, and I was equally keen to join my battalion. I got an urgent message from my commander that my best frined "Naipaul" was killed in a gun fire between the millitants, it landed as a rude shock on my head, and i could not control my emotions. There was this emotional battle in my mind saying, "If I were there, I would have saved my friend". This news added fuel to my fire and I was determined to go to the camp and demolish that militant base. It was 5:00 in the evening and Anjali was resting in her bed, I stood beside her with my army uniform intact, that conveyed the message to Anjali and she helped herself to get out of her bed, head towards the pooja room and came back with a plate of "aarathi" and "kunkum", she pinched a gram of kunkum and applied on my forehead and fell on my knees to seek my blessings, i too applied the sindhoor on her forehead and kissed her, she nodded her head in the sign of acceptance for me to go back to the Army camp, thats my wife Anjali, she understands me very well, and i really dont want to speak to let her know what I am thinking. I told her the bad news that "Naipaul" was shot dead, and that brought a tear ball to pop out of her eyes, yes Naipaul is more than a brother to Anjali. She told me that she will pass on the news to me once she delivers a baby and will wait for my return. I padded up my weapons and got ready to go back to the army base, I had my vechile coming at my door step to pick me up. My mom, who is inturn a wife of an army man, did not show her emotions out, and needless to say about my dad who is a retired army officer. I seeked their blessings and told them to take care of Anjali. I could still remember the sight of Anjali standing at my house and waving her hand at me, till my jeep turned into a small dot for her vision. It was a very tough battle at the war field, i was posted at SECTOR-18, which is the most vulnerable zone for militants to infiltrate, I have to be in vigil for many days, I should admit the fact that I almost forgot Anjali and did not realize that I am expecting a good news from my family. It has been 13 days since I was put on safe guarding the border, and one fine morning, my commander came to my camp and asked me get back to the base and take a day off. I was very tired and hence I was thankful to my general who granted me this day off. I was greeted by all my fellow army men and, one of my friend inserted a big ladoo in my mouth and said that, I have become a proud father of a cute baby boy. I just could not express my happiness in words that day, and i thanked all the GOD for blessing me like this. That happiness did not last for long, as I was asked to go and meet our chief commander. I initially thought that he has called me to wish and congratulate for the birth of my son, little I know that he is going to spell the words of doom, yes he had a telegram in his hand, which carried the good news of my son's birth and also the bad news of my dear Anjali's death. She could not survive the delivery, and hence she died due to some complications. The entire world crashed on me, and I just did not know how to react. I controlled my tears in front of him, gave him an army salute, and waited for his next order. He asked me if I need to go back to my village to meet my son, at that point in time, I just had the vision of saving my nation from the millitants, and hence i refused to take up the offer. I wanted to forget this trauma, and hence i went back to the camp the next day, all my fellow army men who came to know the news, tried to make me feel comfortable. I once again got into my business and fought hard to kill most of the millitants and save my motherland. After a hard fought battle for nearly a month, the war came to an end, and we stuck up the tri-color flying high in the montains of himalayas and came back triumphant to the base. Days rolled on, Months rolled on, Years rolled on, I did not get my chance to go on a long leave, for some reason or other, my request for leave has been postponed. That is army life and you have to accept it, as you represent your country. He told himself "I wanted to meet my son, I wanted to see how he looks like, I need to make him an ARMY officer, I am sure i will meet him one day". Tears rolled out of Naipaul's eyes, after reading the dairy of his unseen dad, the only article which was returned by army after Vineeth died in a grenade attack. Well, Naipaul heard the horn sound at his door-step, yes, this Lt. Kernel Naipaul has to go back to the army base, leaving his wife Mamta, who is expecting a child. THIS STORY IS A TRIBUTE TO ALL MY FELLOW BROTHERS WHO ARE SAFE GUARDING MY COUNTRY, BY MISSING THEIR LOVED ONES AND FAMILY, JUST BECAUSE, I HAVE TO LEAD A HAPPY LIFE WITH MY LOVED ONES AND FAMILY. Some had good qualification and a good job, but their expectation does not match to his needs, some had matching expectations but that does not match his requirements, at one stage he was totally fed up and cursed himself for such a situation. He went to chk out the charts without even having his breakfast and came home by noon. His aging mom could clearly see the dejection on his face. He asked for a glass of buttermilk and after gulping it in one single shot, Lakshaman said, "Mom, I think its very difficult to get a girl for my brother Raman, as none of the profiles match his requirements", his mom was overwhelmed to see that he is so caring for his brother marriage and his future, but we know that he sees his unemployed brother Raman as a bottleneck, for him to marry Sandhya. Who would say a NO to watch Sachin Tendulkar and Shane Warne facing each other on the field, who are now playing for their representing county and not their countries. So this short version of the shorter version of the game (I mean 20-20) is expected to create the spark and ignite the hearts of zillion cricket fans in the country. Its gonna be a treat for the next 45 days and it is going to bring in more excitement than watching the World Cup. Players from all 10 test playing nations have been bid to take part in this tournament and to stress on this point, a huge sum of money has been invested in this tournament, that itself has created a big expectation amongst the cricket fans. Well, i would try to sneak in for a match direct to the stadium if I have time. I totaly respect and admire the visit by Priyanka, whatever be the background motivation for this meeting, but going and meeting an accused who was part of killing her father, really needs a BIG HEART. I am sure it must have been an emotional one from both the sides and its pretty weired to think what they could have talked. As far as the sources of media goes, it looks like Priyanka enquired about Nalini's daughter and also congratulated on her successfull completion of MCA that too with a distinction. Also Priyanka spoke to Nalini in detail about what exactly happened on that fateful day of May 21st 1991. It was believed that both of them exchanged few gifts and thats something not poked by the media. After this meeting with Priyanka, Nalini felt that her soul has been cleansed by the visit of Priyanka and the respect she had towards Sonia Gandhi has increased heaps, it was Sonia who appealed against her death sentence and changed it to a life imprisonment considering the future of the then 5 yr old daughter of Nalini. Its actually good to see such an attitude from the great family of "Gandhi's" and it would be really wonderful if this was not done for the sake of gaining some cheap public sympathy, which inturn changes into votes, as everybody knows that we INDIAN's are a bunch of emotional unit. உன் திருமண அழைப்பிதழை கொடுக்க வந்த போது ? வேறு என்ன செய்வாள், வீட்டில் அடைக்கப்பட்ட இளம் விதவை ? மாலை முழுதும் விளையாட்டு, என்று பழக்க படுதிக்கொள்ளு பாப்பா"
ரோட்டில் பழைய பேப்பர் பொறுக்கும் ஐந்து வயது முருகன். Varun was not so sure about his new assignment and he has his own hooks hanging over his head about his new job. Kavya on the other hand thought that it’s a very good break for Varun in his career and she was pretty much excited about it, infact she was aslo happy with the hefty package Varun has got with his new employeer…. Varun: So do you feel that I have done a mistake by taking up this new assignment ? Varun: Don’t you think you should have told me all these before I made up my mind ? Kavya, just had to whisper into Varun’s ear that he is promoted to the nexl level in his personal life. Yes Kavya and Varun are going to be proud parents very soon. 1. Change this complete political system and bring in tough norms to participate in elections. 10. Infrastructure across the country has to be improved by laying good quality roads and the responsible company which took the contract should pay a huge penalty if the roads go bad within a stipulated amount of time. This guy’s father came to him one day and knowing his shy personality, he adviced him saying, “My son, don’t be shy and timid at this stage, you feel free to ask whatever you want to your future father-in-law, and please always remember that you should ask for something bigger and then only you will get what you actually wanted, for example, if you want a bike, you should ask for a car, if you want an aparment you should ask for a villa, if you want a gold ring, you should ask for a diamond ring”, hope you got my point”, after this piece of advice, his father leaves his room. Our hero got the message and he too was convinced with the fact hidden behind that. One fine day, his future father-in-law came to his house to meet him and discuss on what all things he needs before marriage, the discussion went on for about 5 minutes and after that there was a big scream and a tight slap, his future father-in-law came rushing out of his room and spit on his dads face and said that the marriage is cancelled, the shell shocked dad does not know what happened between them and rushes into his son’s room to enquire what made this father-in-law to go mad and crazy. Our hero replied, its all because of you dad, and his dad could not understand the meaning of it, so he asked “Why because of me ?”, his son replied, you only told me to ask something bigger, so that I can get what I really wanted, so he asked me what I want from his side, and I told him that I need his wife, so that I can get his daughter. Carpenter - Hey darling, you have hit a nail straight into my heart, and no cutting plyer could take it out, please apply some turpentine to my wounded heart and lets unite like a fevicol. Plumber - When i think of you, love flows like a leaking tap. I tired many washers to stop that leak, but none worked, i know your love is in the pipe line, please let the valve open and shower your love on me. Lawyer - Oh my lord, may i proceed with my argument ? I would want to prove my innocence to you and appeal to your notice that i am in love with you. Kindly grant me a life scentence in your heart which is non-bailable. Car Mechanic - Oh sweetheart, my engine is failing to start if i dont see you even for a day, my legs apply automatic brakes when it crosses your house. Please pour your love oil into my engine and increase our love mileage. Cricket Player - Hi darling, my heart is WIDE open for you to SWING inside. Please dont DEFEND my love or WELL-LEFT it. I will be your KEEPER and will follow you to all BOUNDARIES of this world. Without you my life is a NO-BALL. Software Engineer - Oh you are the virus who entered my heart which was behind a fire-wall. I know i am bitten by this love bug, and trying to comment out the love lines which has some errors. I would like you to appraise me, and i hope you give me a good hike from lover to husband. I want you to give me three months notice period, failing to accept my love. I took this decison based on some actions taken by my management which really upset me and I felt very bad over those decisions. I felt that my management is not really taking care of my team and they failed to sense the quality of the resources. I happened to lose two good quality people just for the heck of it. Today they have taken a replacement for my team by paying a very high salary to a new comer, if the management would have spent half that amount on the old guys, they would have retained them as well as their experience and expertise. This is one area all management teams make the mistake, they think they can get the job done with a new comer and they just dont care about the existing experienced people. Its now almost curtains for my existing team with just one junior member working for it, I hope my management atleast takes care of that resource and try to retain her. People working for BRAND is now a history, people work for better challenging opportunities and a hefty pay package, I hope my management hears this loud and clear and take appropriate action to avoid further damage. But its an excellent team to work with, the director who heads our unit is a great human being, but unfortunately his hands are tied and mouth stitched, so poor guy could not do anything beyond his limits. I wish this team a good future and great success and I hope they start looking at people's quality and reward them as accordingly. Its really really tough to miss a company to which you have been associated for almost a decade. This is one place where i loved to play a longer innings, but its so sad that i have to call it a day very soon. First this old politician of TN should have kept quite, he waiting at the door of his death is spelling some unwanted statements and is upseting the rythm of normal life and creating chaos amidst the people of two states, already we all know that these two communities are under some kind of friction always, and politicians are pouring oil into that. The funny things which i try to understand here is, why the hell anyone has to stop airing the respective language TV channels ? What are they trying to say out of this ? doesn't this sound stupid ? what is the point in breaking theatres and shops owned by the respective community ? Its a shame on us that we have allowed stupid and illitrates to rule this country. The situation will change only if educated people venture into politics and clean all these filthy people.